Keurig(R) K-Cafe(tm) special edition single serve coffee, latte, cappuccio maker. Use any K-Cup(R) pod to brew coffee, or make delicious lattes and cappuccinos. Four cup sizes 6, 8, 10, and 12 ounce. Large 60 ounce water reservoir allows you to make 6 cups before refilling. Dimensions: 12.5H x 15.3W x 11.7D. 16.7H (with handle open). 6.2H mug clearance with drip tray (fits a 7.2 travel mug with drip tray removed). 30.0 Cord Length. Model 5000200558. Turn your house into a coffeehouse! 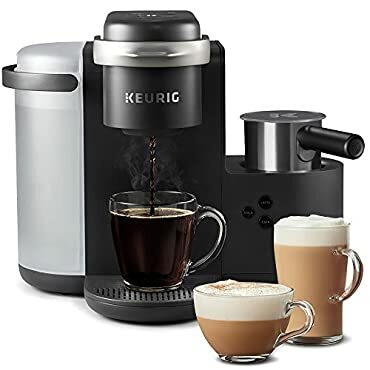 Brew your favorite coffee or make creamy lattes and frothy cappuccinos using any K-Cup pod--all from this simple-to-use K Cafe Brewer. From Keurig. Store: Amazon.com Condition: Brand New Price: $159.99 Total Price: $159.99 Buy It from Amazon.com Want it delivered by Thursday, April 25? Choose AmazonGlobal Priority Shipping at checkout. Store: Nick's Market Condition: Brand New Price: $229.95 Total Price: $229.95 Buy It from Nick's Market Want it delivered by Thursday, April 25? Store: tdmiller99 Condition: Brand New Price: $159.00 Total Price: $159.00 Buy It from tdmiller99 No returns. Store: Texas Exotic Condition: New (Open Box, or other) Price: $109.00 Total Price: $109.00 Buy It from Texas Exotic No returns.